Thinlits create dazzling detailed shapes for more creative cardmaking and papercrafting projects. 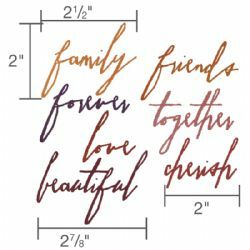 These wafer-thin chemical-etched die sets are designed to cut, emboss or stencil a single sheet of cardstock, paper, metallic foil or vellum. They are simple to use, compact and portable for cutting at home or on the go. Use them for enhanced intricacy and to add a special touch of inspiration to all your projects. These Thinlits Dies showcase the bold and edgy style of Tim Holtz®. His unique artistry can be seen throughout the dies which are compatible with the BIGkick, Big Shot and Vagabond machines.